President DeValera presents Aga Khan Cup at Horse Show. President DeValera presents Aga Khan Cup at Horse Show..1962..10.08.1962..08.10.1962..10th August 1962..In this year's event at the RDS in Dublin, Italy were the winners of the Aga Khan Cup. Italy were victors over second place USA by a single point. The Italian team comprised of:.The Rock ridden by Capt P d'Inzeo.Rockette ridden by G Mancinelli.Fancy Socks ridden by Dr Ugo d'Amelio.Posillipe ridden by Capt R d'Inzeo.Image shows President Eamon DeValera presenting the cup to the Italian Chef D'equipe at the RDS,Dublin. Il presidente De Valera presenta la coppa ippica AGA. Nel 1962 gli italiani furono i vincitori della gara, superando gli Stati Uniti di un solo punto. 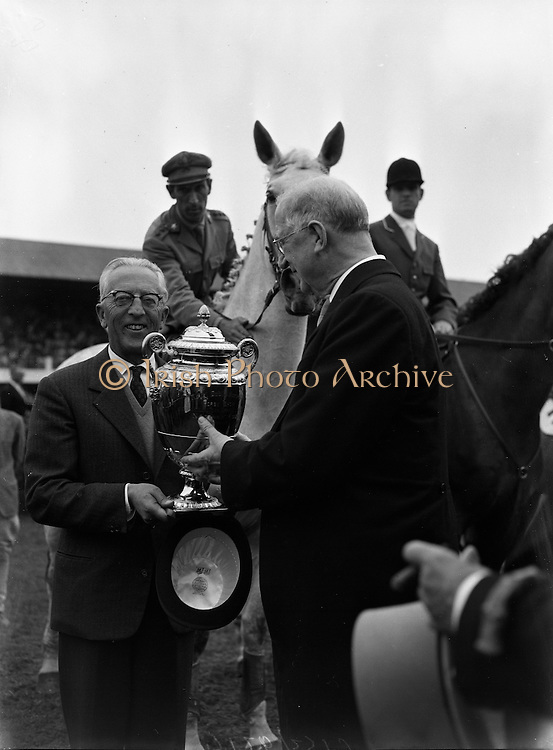 Search ALL, images of ireland 1960s, Search ALL, 1962 - President DeValera presents Aga Khan Cup at Horse Show. C153.